Andy Revkin has a great post today asking the question of whether “the villain” for global warming isn’t so diffuse and hard to define that we are crippled in trying to get the masses to focus and rally. That is my kind of thinking. 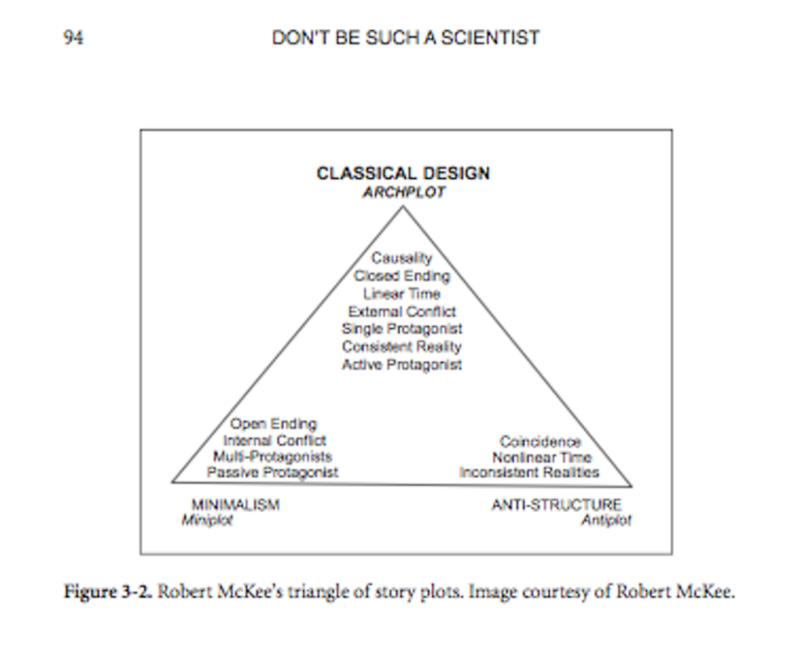 Just look at Robert McKee‘s Triangle — it’s right there. ARCHPLOT is how you reach the masses the best. It calls for a single protagonist, and just the same, a single antagonist. Anything short of this starts to drift you down into the artsy world of MINIPLOT, and thus a smaller audience. MCKEE’S TRIANGLE – I reprinted this figure in my first book. At the top is the narrative structure that taps into “The Hero’s Journey” and reaches the maximum mass audience. Anything that doesn’t match the basic traits listed starts to drift you down towards the lower left, putting you in the intellectual, art house crowd. Such is the challenge of global warming — it defies a number of the Archplot characteristics. HOW DO YOU FIGHT A MIASMA? I won’t do my usual grandstanding here. I only encourage you to read Andy’s piece — he’s on the right track.